you know who i dig as a kool kat? ben franklin. a swingin kat ever the busy body. inventor, innovator, patriotic, intelligent, and all-around well-rounded (pun intended) hard-worker. he goes in my list of hip kats. In honor of the 300th birthday of Benny, here is a website that has more Ben links. its a sad time for all. 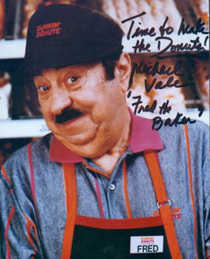 michael vale, of dunkin donuts fame, has passed away xmas eve. i shall have a donut and coffee in his honor tomorrow at DD. who's with me?!? I'd love a donut and some coffee. Do you deliver? you know what's a funny thing? i'll tell you one. some stores around here in grande ole nyc feel that to be "festive" also includes putting up holiday window stickies. nothing wrong with that, right? loads of people put those translucent pictures on their windows. the funny part is that they're pictures of frost. they put frost stickies in the windows. are they not from america or did they grow up in texas? mother nature has provided frost on the windows, and then there is the frost stickies in the windows. you don't see floridians putting condensation stickies up in the humid summer air. what's with this town?? so i'm working tonight, xmas eve eve. til 12:45am. then i'm in at 10-5 tomorrow, then 10-5 xmas day. i'm just fine with that too. i'm glad i'm not gonna be at home all day eating cereal or something. so i brought my new camera with me to work and i've been taking pics. i plan on taking lots of pics now that its uber convenient. yay camera! there is NOTHING to do tonight and NOTHING to do tomorrow. and not much happening xmas day. i say not much because you never know what crazies will be around requesting odd things from me. i'd rather cuddle a gallon of egg noggy but instead i'll probably have to put a tv in a guest room or something ridiculous like that. o well, holiday pay and all! they'd better not put me working on new years eve! i wanna be in times square, not pushing equipment around the hotel. o there are decorations for sure, just no spirit. i'm not speaking to anyone working for mta. those thieves. it won't happen, but i've already made up in my mind that if someone working the buses or subs mentions the strike, i'll give them a swift response involving an F and a U.
I wish you could be here with us. It's a full house with lots of food. Too many folks are tyring to get sick though. today is the 16th. the 16th is today. here i yam. i yam here. o boy it started snowing last night, and then it just turned into rain after about an hour. and then it rained hard. and now its warm out. a balmy 40F. i only have 1 jacket on. heavy melody had a christmas party last night. lots of people came. o joyeous fun times. i got all toasty on beer and wine. then i had to work. phooey! i don't think my managers knew i was consuming alcoholic beverages though. other than passionately ranting about mta, anyway. i think tonight there is like 1 thing to do at marriott. so we're going to watch a bootleg dvd of king kong in the presidential suite. Nija.....what is your schedule? We're coming tomorrow. so MTA (metropolitan transportation authority) is promising a strike in 1 day. oops, strike that, it's friday now. so it's supposed to happen today. if they go on strike i'm in doo doo. shoulders-high in it. i rely heavily on public transportation. hell i have to take a bus just to get to the subway. but marriott will not budge on me having to be there on time. which means i'll either have to walk, find a ride, or take a taxi. all three options requiring a very very very long time. walking would take me about 1 1/2 hours and i wouldn't be worth anything once i got to work. finding a ride from a friend would be imposing a lot. taking a taxi would cost about $13 either way, so about $26 a day. and since everyone else will be in cars, traffic will be congested. the damn mta does not *actually* have a surplus of $1 billion like they claim. not when you take into account expenses for the next year: a new line, upgrading existing trains, more employees/buses. they're already offering an %8 increase over 3 years. this is, i suppose, to keep up with inflation. the union wants 3x as much. its not as if they've earned the sympathy for their cause either. the damn mta isn't even around when i really need them anyway! it usually takes me an hour to get anywhere. when i think of all the time in my life i've wasted waiting or walking because they're never around....... are they trying to say they're worth more money? money that i paid for? hellz no! its an injustice to people that paid good money for tranportation, and now the damn greedy employees are threatening to not provide transportation and i'm sposed to be on their side? what they're doing reminds me of mobsters: they'll take money out of my pocket and there's nothing i can do about it. goodbye new rail cars, goodbye new lines, goodbye more employees and speedier service and it all goes into the unionists' paychecks?? no, they are threatening to strike for a cause they have absolutely no grounds for. i hope this injunction ruins their livelihood and i hope there is a fresh crop of potential employees lining the mta human resources office! Hey, they may all get fired since it's illegal for them to stike in the first place. Maybe I can finally relize my dream by getting a job as a bus driver in New York Sitty. steve and rhonda always ask what i'm putting in my blogs. every day when i see them they ask at some point what has made it into the blog. so now they've resorted to doing crazy things just to see if i'll put it my blog. steve, in "naked cowboy" fashion, has declared himself "clothed podiatrist" and did a little dance in hopes that i would put that in my blog. well steve, there you go! steve might have to front the bill on a few nights stay. he got the bill and it seems that they didn't cover ALL the nights. i think they should have stayed at the "mark-ee" on 78th st. instead. rhonda has comes to grips with crossing the street. she now will cross the street if there is someone in front she can follow. that way the blame is not on her. we walked to bryant park, got pictures of rhonda making good use of her snow shoes, and steve bought me my christmas present. it is a statuette of boba fett from star wars. it is made of scrap metal. screws, springs, bicycle chains. it looks really good; really cool! they are both now at the comfort inn, right across from times square and a quick 3 minutes from work. Motel/Hotel hopping? I din't know there was a Comfort Inn. Who knew. We'll see if the "Clothed Podiatrist" makes the same cashflow. You're blog is awesome..... Keep up the good work. Crossing the street with a mom and a stroller seems to be a safe time to cross even if the light is red! Yes we stayed at 3 places in 6 nights. We were promised 4 night paid for so opted to 'foot the bill' on the last night. Mark is right, we may get stuck with 2 extra nights. Hope the rest of you have an awesome time...dress in layers. It is soooooo cold outside, but very hot in doors if you stay dressed in all your layers. i spent the night at the milton. well, the morning, really. then they kicked us out at 12 noon. so at 11:45 i jumped in the shower. steve said "if it gets scalding, don't worry. it will pass soon". apparently this hotel still has plumbing connected to the toilets. but it was nice to be warned. well maybe that was the case when he took a shower, but it didn't stop with simply being scalding every now and then. it actually just flip-flopped between scalding and freezing. he wondered why i screamed "you lied!!" while i was yelping in the shower, trying to dodge in between scalding and freezing, washing carefully between the pulses when it was suitable to be under the nozzle. rhonda has taken the other course in jumping in front of cars. now, even if there are no cars and the world is crossing the street, she will wait for the light to turn. we learned that the milton is actually a "milbrook" or something, but we still lovingly call it the milton. we ate lunch at a mexican restaurant called "sombrero" on 8th around 44th. rhonda was pleased as peach pie and had wonderful things to say until she couldn't get a refill on her $3 glass of coke. then, all the sudden, there are horrible things wrong with this gawdy place. steve waited at the tkts booth for tickets to RENT and R and me got coffee. it was cold out. then its off to macy's, christmas capital of ny! -swat team with machine guns patrolling in front of the "miracle on 34th st." displays outside. -the very first escalators invented; made of wood and pulled by horses (originally). well ok i made that up, but they were made of wood. -christmas land where you can meet santa claus!! well, no... what is that?? o, its santa claus projected on a screen! yay! sure am glad i waited for an hour through christmas land. RENT was an excellent musical and reminded me of a few situations i had been in while in ny so far. steve enjoyed and and rhonda, despite not typically liking these kinds of musicals, had a good time. success! I would have NEVER chosen to see Rent on my own. But I am very glad Mark suggested it and I went 'outside of my box' to see it. I cried at the end. Second half really pulled the story together for me. Thanks Mark! my glorious brother and his glorious wife are having a glorious time in this glorious city. o the glory! they did not bring anything to sleep on, so they got my mattress and i slept on the floor. rhonda forgot what its like in a big city and scampers in front of cars, screaming. rhonda also didn't bring the right footwear and her feet hurt. no female to visit here so far has ever brought the right footwear. steve's reservations for the hilton fell through, so he's at the "milton" now. hahahaha i love it! who knew there was a Milton hotel right up a couple blocks from the Hilton. at least he gets reimbursed. its really nice seeing them. christopher's voice has lowered considerably since i remember. now, instead of squeaking, he sounds like a girl. christopher, every night during the "goodnight phonecall", will ask if we are eating at uncle mark's favorite pizza place that uncle scott hates. its as cold as its ever been now. no snow, but whipping wind and sub-zero temperatures even in the afternoon. i am inspired to wear many layers. even trying to fit the trench coat over the winter jacket i got for christmas. and that makes me look like a ninja turtle in-cognito. tomorrow, i'm sure, will hold more glorious wonders for gloriously wonderful holiday times. I warned you about the sleeping arrangements. We brought our own air mattress. Milton....wonder if it's anything like the Palmer? My shoes were great, just had them tied too tight the very first day. We knew sleeping arrangements would be on the air mattress, we just thought Mark had 2. Everyone walks in front of oncoming traffic, so I tried it, but didn't like it. It was a GREAT time visiting with Mark...great host!! uh, happy holidays everyone. i guess that came off as humbuggy. far from trying to sound in any way, overt or seruptitiously, cynical of what my dad wrote in his blog about holiday shoppers, i have a quip against a short quote he used. you see, i've found out recently that "good will towards men" is (not suprisingly as much of the language is bastardized) yet another rogue phrase that has drawn light away the original context through years of positive, yet incorrect, reinforcement. it is an aberration of "peace to men of good will". it can be found in Luke 2:13-14 (the old version). It has, after all, been rewritten ("d'oh!") as "peace to men on whom his favor rests," which, i suppose, is modern times' response to the dumbing-down of coherence to all ideas, whether derived from literature or the spoken word. although i'm not suggesting that "good will towards men" is blasphemous; it sure sounds like a nice thought, doesn't it? to think good thoughts of everyone, regardless. its just a happy thought that does no good or bad either way. but the accurate dipiction is that of peace going only to those whom deserve it. and that, on a side note (sorry to say), does NOT mean, distinctly, that it will be peace on earth. after all, christianity reveals that christ is the savior and the only one that will bring us to heaven through his sacrifice (his being mortal). that said, there is NOTHING we can do on earth to save ourselves, or to bring peace to ourselves through the righteous god. christianity says jesus has already taken care of that for us. so yes, it probably translates into peace in heaven. it reads: "and on earth, peace to mean of good will," which probably means simply "and of the men who live on earth, the righteous shall be given peace in heaven". but i've just started on a tangent rant, which was not my intention. i truly could write volumns on my ideas of religion, but i will spare this blog's function. "peace to men of good will" is the correct phrase. well today at the marquis was employee appreciation at the cafeteria. this has to do with our GSS (guest satisfaction survey) scores being the highest its been in years. i tribute most of that to myself. i'm awesome for this place and they should grovel, but that's another blog i suppose. so to celebrate, they gave everyone filet mignon and lobster. the filet was dry by the time i got there (starting work at 10:30pm usually does that to you) but the lobsters were kept in the hot box until you asked for one. i have never had the privalege of cracking open a fresh lobster before. most of the lobsters i've eaten (at grande lakes) were already cracked open and buttered and delicious. so to th0se of you who, like me, haven't experienced the full joy of this experience, let me describe it to you. you get the corpse served on your plate. and yes, its a corpse because of the way it flops. its organic and lumpish. fleshy. it was disturbing. i much preferred having not to recognize what i eat. give me a meat patty and don't tell me its name. i felt sorry for it. then i started playing with it. "weeeeeell, mrs snerdgrass! looking *sharp* tonight?" waddle waddle. you have the option of having cracking utensils, which i declined because i was with the "lobster expert" at my table. make SURE you get butter. so you have the lobster corpse and you're sitting down at your table. where to start? how to do this humanely? well, you DON'T do this humanely; it's already dead! you rip off the tail without grace or forgiveness. pry apart the legs and don't stop until they snap apart. your reward: the tail! ah, the tail! chewy rubbery white meat with red on top. dip it in butter and chomp away. ah, ok, nice-ish. now what next? staring down the gutted body. it smells and all you see is green mush. like a cross between pea-colored apple sauce and crushed pistachios. how in the world can all that in there function together to sustain a life form? there doesn't even seem to be enough green mush in there to fill in the empty exoskeleton. but, which part do you eat? ...mostly (the claws still have about 3 centimeters of meat on them. not even worth the effort). the creature died for its tail and most of its body is thrown away, inedible. the body is dumped into a bucket. now apparently its considered ok to put this bucket on the table. so its basically a trash can that you put right by your food. i don't get it. and i don't get lobster's popularity. no more do-it-yourself; lobster MUST be prepared for me from now on! man... you get appreciHated more than anybody I know!!! Les Poissons, les poissons.... Mark just LOVEs les Poissons... Like to chop and serve little fish. So there are some perks to working at the hotel! Looking forward to our visit on TUESDAY. The green mush is what the lobster ate. It's a delicacy to some. To me, it's s---, and I don't want to even see it. I think you're correct in saying lobster is over-rated, but you've got to stop playing with your food. pigeons be gone this instant!